Businessman Sir Alan Sugar is back to decide the fate of 14 people vying for a job at one of his companies, with all contestants desperate to win a £100,000 contract rather than see him point at them and utter those famous words: "You're fired." 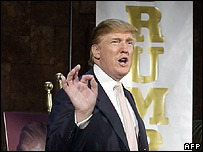 The Apprentice is back for a second series, having established a strong audience on BBC Two with the first, based on the US version fronted by entrepreneur Donald Trump. 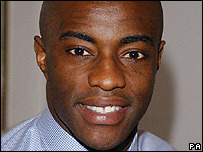 The winner of the first UK series, Tim Campbell, is still employed by Sir Alan, who has praised him as "a lovely fella". Campbell has rarely been seen in the media since his win, apart from a update documentary, instead focusing on building up his career under the tutelage of Sir Alan at Sir Alan's Amstrad company. And Sir Alan is keen to ensure that nobody seeking fame rather fortune appears on the show. "I take this programme seriously. I have always got space for a great person to come into my company. From my point of view I'm looking for someone to come in and work for me," he said. "Last year it was evident a few people were there for the wrong reasons. This year I didn't want to do that. It's a business programme, not a media enhancing programme." The format for the second series remains the same as the first, although producers have listened to audience feedback and will have more footage of candidates carrying out their tasks. "The tasks we are going to put on are a combination of skills in negotiating, sales etc," Sir Alan said. "It's not much different to the X Factor in that the format stays the same. What we have to focus on is the people." But the show will still feature Sir Alan shouting at those he thinks are not good enough, and humiliating those who try to fob him off with excuses. "I think I got into my stride by the end of the last series and carried the momentum on to this one. As you watch the show unfold there are incidences where you will see me get very frustrated," he said. He does not even give the 14 contestants an easy ride for their first task, heavily criticising both teams for the way they ran their money-making schemes. Sir Alan is in no doubt as to what would have happened if The Apprentice had been around when he began his working life, from his family's council flat in Hackney, London. "I think I would have won if I'd been on the show 30 years ago." This series saw twice as many people apply to take part as for the first, with Sir Alan only getting involved in the selection process at the very end. "The production company is responsible for starting off the search from the original 10,000 and bringing it down to 25," he said. "There has always been a debate between me and the production company as to whether it's right for me to see these people beforehand or even to have anything to do with the selection. "I would like to have a look, but really they are right as well in that I shouldn't have a hand in selecting them. "In the end I had a look at video footage of the last 25 or so and looked at the CVs and debated them. For the last lot I had a little bit of influence." Talk of a third series was premature, he said. "I'd like to see what the audience thinks, and it's not really down to me. Who knows. There have been no discussions about another series yet." Filming for The Apprentice takes 12 weeks of his time, but he is adamant that Amstrad does not lose out - although he says it does not benefit from the airtime either. "Taking part in it hasn't done anything at all for business - that's because the BBC won't allow us to plug it at all," he joked. The Apprentice begins on Wednesday on BBC Two at 2100 GMT.